Welcome to the Spring Frost book tour hosted by The EDGE Books. 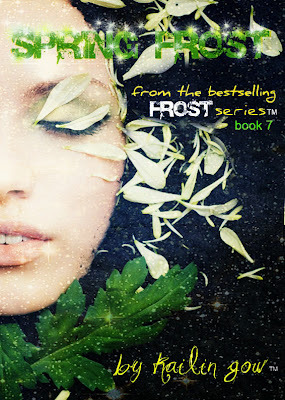 Spring Frost, book #7 in the Frost Series was just released April 9, 2012! I'm so honored to participate by posting an interview with the one and only - Kailin Gow! What is The Frost Series about? The Frost Series is about a place called Feyland, and the lives, loves, and deaths of incredibly beautiful but dangerous fey who would do anything to protect their land. The story originated with The Fairy Rose Chronicles, first published in 2003, about Feyland as seen through the eyes of a young Summer fairy name Rose. The series progressed to the heart of the series, starting with Bitter Frost, which tells of a human girl name Breena, who is the lost heir to Feyland, and her rise from awkward teen in high school to the full-fledge ruler of Feyland. At the same time, there is the Wolf Fey Series, which is Logan, the Wolf Prince’s story. What makes the Frost Series stand out amongst other paranormal series? There are so many good paranormal books out there, and let’s face it, many resemble each other because if you follow any kind of folklore and mythology of a paranormal entity, they all have to have something in common. From what I’ve learned, ideas cannot be copyrighted, plots can’t be copyrighted. The Frost Series is about fairies, seasonal fairies which is a common mythology – Winter, Summer, Autumn, and Spring. They are at war with each other, which is another common fairy lore. Fairies often have human interactions, having children that are mixed, placing changelings in human babies’ beds, so there are bound to be fairies who are human and fey. What makes the Frost Series different is that there is an entire world built up on Feyland from many different perspectives – Rose, a Summer Fairy, gives the perspective of Feyland from a young fairy who grew up there and is familiar with traditions and culture there, in the Fairy Rose Chronicles Series (written in 2003 so it’s been around). Because it started in 2003, the world of the fey is more of a fairy tale and fantasy version, rather than the 2010s version of dark and urban fantasy. Bitter Frost takes place 5 years after the Fairy Rose Chronicles, which is the epic years of Feyland were Winter and Summer have been at war and will be changed by an unassuming girl named Breena, who is more than what she appears. Then there is the Wolf Fey Series, which gives the perspective of Logan, a wolf fey, the Prince of the Wolves from Feyland, who are the fringe subculture of Feyland, and resides in both the mortal world and Feyland at the same time. The Frost Series is rich in world-building and characters because of so much material associated with this series. Because of this, there are so many different ways to tell the stories of Feyland and its people. What to expect with the 7th book of The Frost Series, Spring Frost? All the characters have to grow up as they face the greatest evil Feyland has come across since ancient times. There are significant reveals with Breena and Logan. There is also major heartache and of course an epic battle with unkillable foes. The Frost Series have a lot of exciting developments, care to elaborate? The Series will become a virtual game that is very cool. When the book series was presented to the producers, there was a lot of excitement with the possibilities! I’m very excited because the game company making this happen is the top of the gaming field in this area so I know it will be a top-notch experience. The Frost Series have a few other exciting avenues coming up: audio books is coming along, as well as translations into 15 languages. There are some gigantic projects I can’t mention any details about, but they are within the next few years. Winter, Summer, or Autumn Springs? The Winter Fey are known to be colder, nobler, and sticklers to tradition; while the Summer Fey is known to be more easy-going. The neutral fey in the Autumn Springs are known to have the most magic of the Seasonal Fey in Feyland. I would say neither, or Frost Fire – the combination of Winter and Summer. I currently have about 20 active fiction series going on, so that keeps me very busy. I love the variety of these series, too, so I can’t have it any other way. Besides YA Paranormal series and dystopian series, I am writing YA and New Adult Contemporary Romance such as Saving You Saving Me, which is tied into a website that helps young adults with their problems in an anonymous and open way. http://www.SavingYouSavingMe.com I’m also working on my Inner Heroine Workshop for young women during the summer. Being able to entertain people with these stories while being able to do something good for people. For instance, the Saving You Saving Me Project and the Inner Heroine Workshops are what I do because I’m passionate about helping others. Thank you so much Kailin. Your wonderful stories and hard work are truly appreciated!